This reaction has seen Violent Soho play to masses of fans around the country, including appearances at Falls Festival, Big Day Out, Groovin The Moo, Splendour in the Grass, triple J’s One Night Stand and a completely sold out 14-date national headline tour. They’ve also been nominated for a total of four AIR Awards (the most of any act this year), locked down international label deals with the influential record companies SideOneDummy (US/Mexico) and Dine Alone (CAN) and had a single voted in the top 15 of triple J’s Hottest 100 earlier this year with crowd favourite Covered in Chrome. With all of the above already achieved, today it is with great pleasure that we can announce that Violent Soho’s Hungry Ghost LP has achieved gold status in Australia (35,000+ sales) - a testimony to the band’s music, friendship, perseverance and belief that if you fight the good fight long enough, you might just get a little win every now and then. 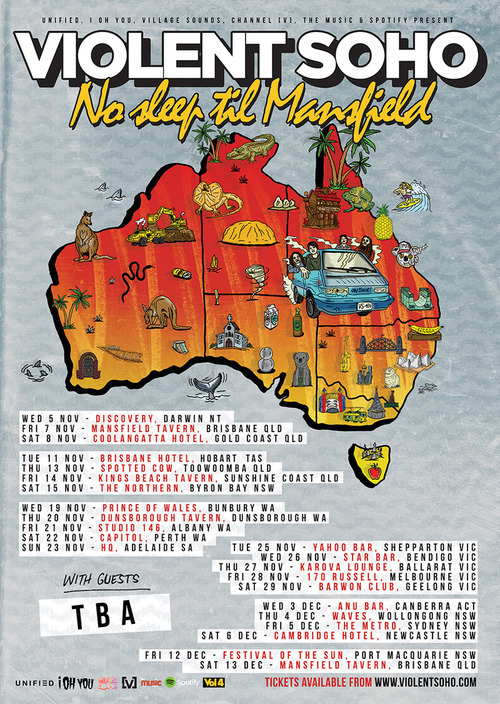 Thankfully, Mansfield’s favourite sons are choosing not to slow down and instead are excited to announce the No Sleep Til Mansfield tour, a huge 23-date national tour that will see Violent Soho hit every capital city in Australia and a number of intimate regional towns that the friends are yet to have visited on the Hungry Ghost album cycle. As ever true to form, the band will be bookending the tour with shows in their home suburb of Mansfield at none other than the Mansfield Tavern (of course, their idea). These dates promise to be full of all the Violent Soho swagger that fans have become accustomed to and will also be punters last chance to see them perform in Australia before they go into hibernation to write album number four.